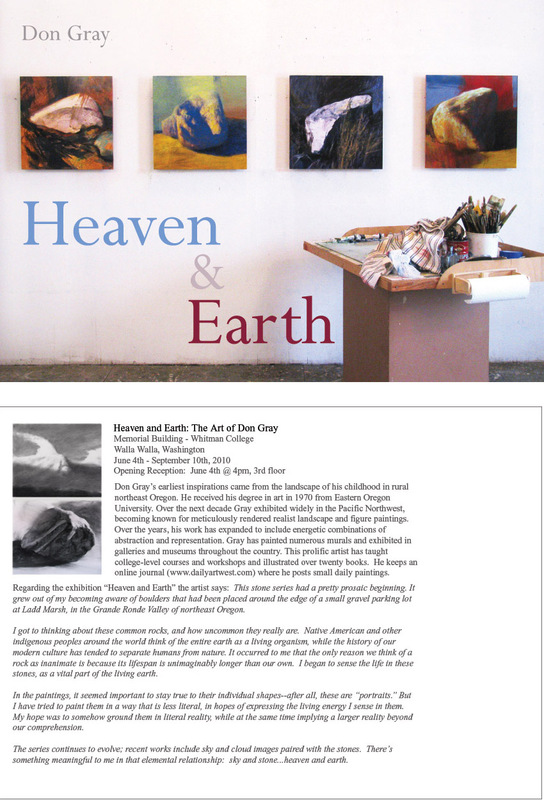 Click the above image to view the postcard for my exhibit at Whitman College, in Walla Walla, Washington. If you're in the region, I hope you'll come to the reception and say hello. If you're not in the area, just jump in your Lear Jet and come anyway. The dailies have taken a back seat lately to my show preparations. I have to deliver the work next Tuesday...it's almost panic time! i hope the preparations are going well. the card is beautifully composed (i've left you a question on my blog under the shoes painting about composition). reading the card, i was touched by your description of your work and it suddenly occured to me that the stones had been given another form of life through these wonderful portraits. The fleeting cloud formation vs. the rock's shape that will not change much for an eternity. Good contrast. You could place a lot of symbolism in this combination. Beautiful - while you're there stop by Syzygy Wines and see my paintings! I do love Walla Walla and I should be back over there before your show ends. It will be great to see your work in person! My Lear jet is in for repairs...wish I could see this in person, it looks fabulous Don. Good luck with the show! It looks like a great show! I wish I could be there; it would have been a great opportunity to see your show and visit my aunt and uncle (my uncle was a sociology professor at Whitman). I will pass the invite along to them! "Given another form of life..."--what a nice way to put it, Rahina--thank you. The staff at Whitman designed the card--I thought they did a nice job. Thanks a lot, Kristen and welcome to my blog. Hi Lisa--thanks. That's great your work is there at the same time--I'll look forward to seeing it. You have a real feel for that rolling eastern Washington landscape. Dana, thank you so much! I really enjoy your painterly work. It's a very small world, isn't it Leslie? thanks for the encouragement. I would love to see your show! I just love those charcoal earth and sky drawings! That video is great--the music goes so well--very mesmerizing! Your supportive comments are much appreciated--thanks! Seriously, Martha, was that really the word verification?...I love it! Thanks for the great note. Went to Walla Walla this past week and was thrilled to see your work at Whitman. Have been enjoying your daily paintings for some time now and it was so much fun to see some of those paintings in person. I love your colors, but also the charcoal and watercolor works were very interesting to me. The size of some of the paintings was wonderful and displayed so well! Hi Fran--I appreciate your supportive comments! Thanks for taking the time to visit the show--I'm pleased to hear your thoughts.